March is Women’s History Month, but the Crocker Art Museum celebrates women year ‘round! For nearly 20 years, Crocker CEO Lial A. Jones and Chief Curator Scott A. Shields have committed to increasing the number of women artists represented in the Museum’s permanent collection from dozens to thousands. Shields estimates that women artists now represent roughly 25 percent of the collection – a stark contrast to other major museums, where the numbers average less than five percent. And the work continues, with acquisitions and gifts of art to the Museum bringing important work and the women who craft them to light. Ruth Miller Kempster (American, 1905 - 1978), Working Stiff, circa 1934. Oil on canvas. Crocker Art Museum purchase with contributions from the George and Bea Gibson Fund; da M. Lawrence, Marcy Friedman; David Gibson and William Ishmael; Nancy Lawrence and Gordon Klein: William L. Snider and Brian Cameron; Cecilia Delury and Vince Jacobs; Gloria Naify; and others, 2017.109. This spring, we celebrate three solo exhibitions by female artists. The season of women began in January with the opening of E. Charlton Fortune: The Colorful Spirit. Fortune, often presumed to be a male painter, was frequently labeled an Impressionist, though her paintings moved well beyond the style. In the late 1920s, she founded and directed the Monterey Guild, a group of skilled craftspeople who, under her direction, created original, modern artworks and furnishings for churches. Around the same time, in 1918, Francis Elizabeth, the woman who would become Corita Kent, was born. Nun, artist, and activist, Kent, who chose the name Mary Corita when she took her vows to the church, was an extraordinary artist whose Pop art blurred the line between reverence and the commonplace. She reached her greatest fame in 1960s Los Angeles during a time of social unrest, and at the end of the decade, relinquished her vows. Power Up: Corita Kent's Heavenly Pop, opens on February 25. Another exhibition and artist not to be missed is Faith Ringgold: An American Artist. The youngest of four children, Ringgold was born in Harlem during the city’s renaissance. She created her first series of political paintings just as she was becoming involved in the artistic and political events of the 1960s, and she protested the Whitney Museum of American Art’s virtual exclusion of women from its annual show (the Whitney’s 1969 Annual included only eight women out of 151 total artists). Ringgold continues to champion equality and freedom of speech, advocating for female artists and artists of color. While these exhibitions are on view, the Crocker will again participate in the National Museum of Women in the Arts' (NMWA) annual #5WomenArtists campaign, calling attention to the inequity women artists face. Our #ArtOfTheDay posts in March will feature women artists from the collection, spanning several hundred years of excellence. Follow along with @CrockerArt on Instagram or Twitter. Find all kinds of joyful gifts and treasures surrounding women in the arts in the #CrockerStore between now and the end of March. Books, accessories, stationary, games, cards, and so much more! Remember, members always get 10% off all purchases! We welcome members and the public to participate in Women's History Month with us by attending our Panel Talk: Art and Activism, focused on the lives and work of Corita Kent and Faith Ringgold as women, and people of color, in the art world. Join us Thursday, March 22, at 6:30 PM. Looking for grown-up fun for Women's History Month? Mark your calendars for ArtMix Fierce, a nightlife celebration of strong women and amazing male & non-binary allies who value and respect them. This event is for adults 21 and over only; information and tickets are available here. 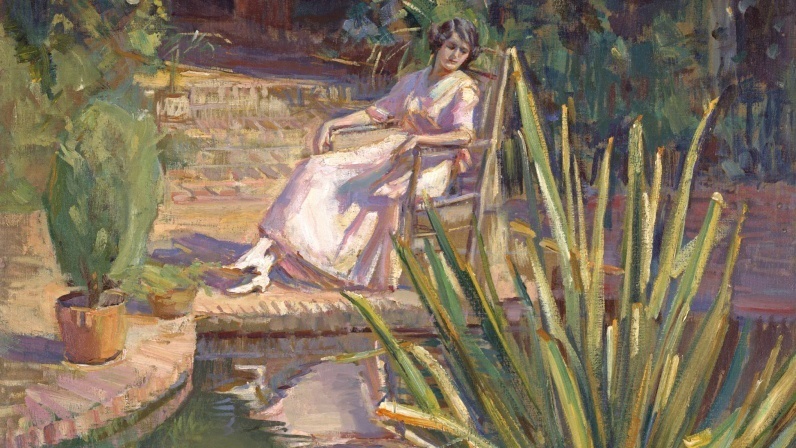 Cover photo: Donna Schuster ( American, 1883 - 1953), detail: Garden Reflection, ca. 1925. Oil on canvas, 36 in. x 36 in. (91.44 cm x 91.44 cm), Crocker Art Museum, Melza and Ted Barr Collection, 2008.103.